ARIZONA LIVING AT IT'S BEST! Location, location, location! Stunning home rests on a SUPERIOR golf course lot, which is just a few minute walk to both the exquisite community rec center and also Lone Tree Golf Course Club House. Soaring high ceilings you as you enter this UPGRADED floor plan wall to wall. 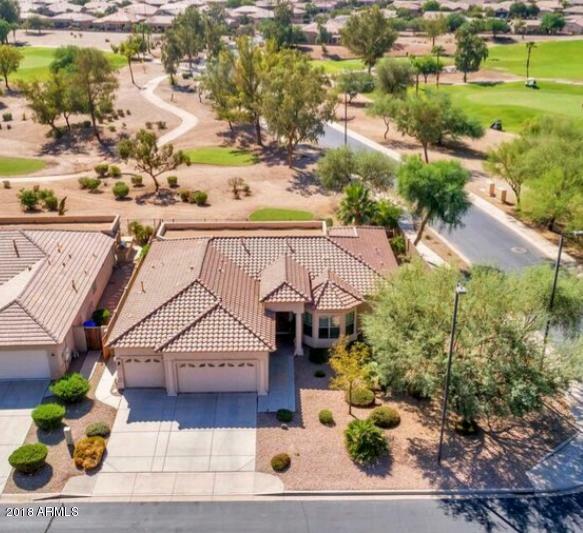 Kitchen boasts of cherry cabinets, granite counter tops, granite back splash, and overlooks both a SPACIOUS great room, golf course, and mountain views. Neutral tile /carpet, plantation shutters, and two toned paint are throughout this beauty of a home. The 3 car garage as well as several interior closets, allow plenty of space for your storage needs. This home is absolutely MOVE IN READY. The back yard is ready for your entertaining desires.Stamped concrete, travertine pavers and a built in fountain enhance this large space. 3 car garage is highlighted with built in cabinets as well as a 4 ft extension. Just a few more upgraded features to this home include surround sound, a fireplace, roll out shelving in the kitchen cabinets, water softener, additional exterior lights and spot lights. Most of the furniture is available for sale on a separate bill of sale. Welcome Home!